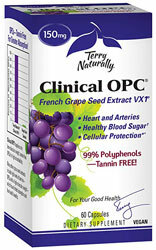 Clinical OPC by Terry Naturally, has super-antioxidant power.In a comparison to 7 other grape seeed extracts, Clinical OPC had the strongest ORAC value of 2,103,300 per 100 grams. Oligomeric proanthocyanidins (OPCs) are the powerful health promoting nutrients in grape seed extract. Researchers have found that grape seed extract is one of the most promising botanical extracts in the world for a diverse array of health applications. Clinical OPC supplies only low molecular weight, tannin-free OPCs for high absorbability. Many other grape seed extracts include high levels of tannins -OPCs with a high molecular weight- which have limited absorbtion and few health benefits. Other Ingredients: cellulose powder, hydroxypropyl methycellulose (vegetable cellulose capsules), silica, vegetable source magnesium sterate. Suggested Use: 1 capsule daily, may take up to 4 times a day for enhanced benefits.